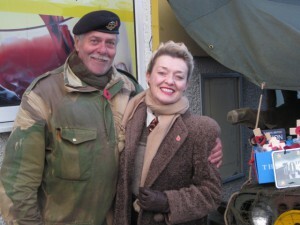 Ste Marie du Mont and the Poppy Man of Pitstone! 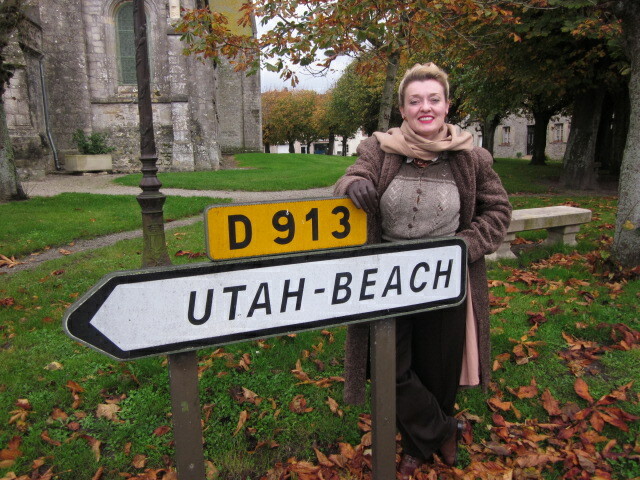 Out and About in Ste Marie du Mont! Paul, Sandra, Jim and Me! Joe Marling the Poppy Man of Pitstone! Paul and I with Philippe! 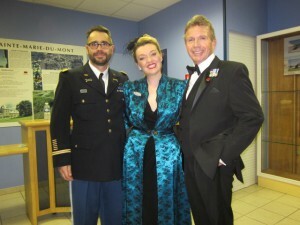 Hello every-one it’s been a fantastic weekend and I’m not long back from Normandy after performing at Salle des Fetes de Sainte in Ste Marie du Mont for the towns annal 1940s dance. It was lovely to be invited back after my performances in June so a big thankyou goes out to Jim and Philippe who made this possible and to Sandra who gave Paul and I such wonderful hospitality. If you have been following my blogs you will know I travelled down to Portsmouth after my Halloween show on Friday and we then caught the over night ferry to Caen/Ouistreham. Paul and I docked in at 6.45 am and we drove our way to Raids which isn’t far from Carentan and not so far from Ste Marie du Mont. 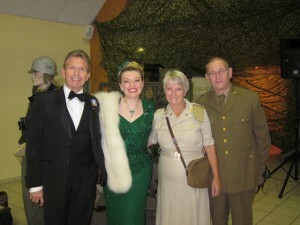 I was engaged to perform 2 x 45/60 mins sets of 1940s swing dance music which went down really well and I also musically moved things on a little to the 1950s – 60s with some good old American Rock and Roll. Ste Marie du Mont isn’t far from Utah Beach so during the war it was liberated by the Americans which is why I thought the rock and roll would go down well. I concluded my show with Edith Piaf’s Mon Dieu and I’m now looking forward to returning next year. I’m already working on new French songs and I have some ideas about arrangements which I’m looking forward to putting into production. I’m afraid my visit to Ste Marie du Mont was only a lighting stop and once again Paul and I caught the overnight ferry home on Sunday night, docking in at 6.45 am this morning. When ever I travel to Caen I always make sure I book a cabin and get my head down straight away. A cabin can make all the difference as I’m not very good at sea. The last two times I came over on the fastcat into Cherboug and was very unwell so for me the cabin is a must! On my way home from Portsmouth I called in to see my friend Joe who at this time of year parks his 1940s jeep outside Masons stores in the village of Pitstone and collects money for the Poppy Apeal. I think last year he was able to raise £2,300. which is a great achement. This is why Joe is known as The Poppy Man of Pitstone and he’s keen to beat last year’s target! So if you live locally do visit Joe and buy a poppy from him not forgetting to wear it with pride!